Kathy Jean Claridge. Kathy passed into the next life at home on Sunday, September 5, 2010 following a long battle with brain cancer. She was born March 22, 1945 in Salt Lake City, Utah to Joseph Fredrick Ehlers and Rose Ida Rosenhan. She moved with her family at the age of 3 to Southern California where she great up attending grade school in Redondo Beach, California, graduating from Palos Verde High School in Palos Verde Estates, California in 1963. She attended Harbor Jr. College as a freshman and married James Duane Claridge from Safford, Arizona in the Los Angeles temple. After the school year they moved to Safford for a year, then Casa Grande for a year and then to Tucson so that James could finish his Master’s degree. They then moved to Mesa in 1967 where she received an AA degree from Mesa Community College and became and EMT working in the Mesa Public Schools. A faithful member of the Church of Jesus Christ of Latter-day Saints, holding many positions of responsibility, Sunday school teacher, Young Women’s advisor, Stake Missionary, Primary counselor and president, Relief Society counselor and president and Family History Consultant. In July of 2002 she served a mission with her husband at the Polynesian Cultural Center on Oahu, Hawaii until 2004. She is survived by her husband James and 5 children; Samantha Claridge of Chandler, David Claridge of Mesa, Carolee Burnham of Gilbert, Jeremy Claridge of Yuma and Amanda Harms of Cambridge, New Zealand. 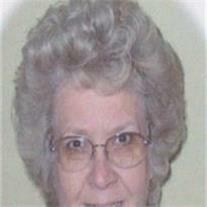 She is also survived by 19 grandchildren and one brother, Stephen Lyle Ehlers of Lancaster, California. She was preceded in death by her parents, a son, James Clayton and two brothers, Jerald and John Ehlers. Funeral services will be held Friday, September 10, 2010 at 10:00 AM at the Mesa Boulder Creek Stake Center, 3025 South Haws Road with Bishop Glen Kennedy officiating. Friends may visit the family from 8:30 – 9:30 AM at the church. Interment will be in the Safford Cemetery in Safford, AZ following the services.